Bryston introduces BP-17³ pre-amplifier | What Hi-Fi? This new Bryston pre-amplifier incorporates Salomie input circuitry – named through its development with the late Ph.D. engineer Dr. Ioan Alexandru Salomie – which can be found in the company’s Cubed Series power amplifiers, and is designed to greatly reduce noise and distortion. Bryston also claims the BP-17³'s engineers have also been able to reduce the effect of radio frequency interference on the signal. There's also a significant array of connections. Five pairs of RCAs – one of which is a tape loop for connecting a recording device – and two pairs of balanced connections make up the inputs, while outputs include two pairs of RCAs and XLRs. 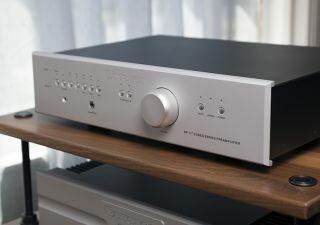 One of the XLRs is switchable between variable and fixed for easy connection to a balanced input headphone amplifier such as the Bryston BHA-1, and connectivity can be further expanded with the addition of a high-res audio-capable internal DAC and/or a moving magnet phono stage (at $750 each). The standalone BP-17³, which comes in a black or silver finish, will be available in September for $3995. Any orders received by 31st August will qualify for a free accessory module: a phono stage, internal DAC or BR-2 remote control. September 2017 issue on sale now!